Miguel Sapochnik (born Miguel Vicente Rosenberg-Sapochnik) is an English film and television director and former storyboard artist of Argentine origin. 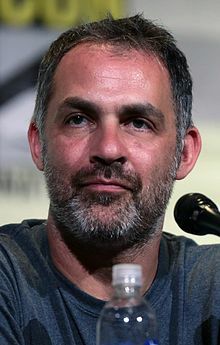 He is best known as the director of the feature film Repo Men, and as a director for the HBO epic fantasy series Game of Thrones, for which he won the award for Outstanding Directing for a Drama Series at the 68th Primetime Emmy Awards and Directors Guild of America Award for Outstanding Directing – Drama Series at the 69th Directors Guild of America Awards. Miguel Sapochnik at San Diego Comic-Con International in 2016. He executive produced and directed the 2010 film Repo Men, starring Jude Law and Forest Whitaker, his feature film directorial debut. Sapochnik has worked on American television series, directing episodes of Awake, Fringe, House, and more recently Mind Games. Between 2001 and 2005, he was a director of Snowflake in Hell Films Limited. His other credits include a 2000 short film entitled The Dreamer, which he wrote and directed, and directing the "Beautiful Inside" music video for singer Louise. As a storyboard artist, some of his credits are Trainspotting (1996, directed by Danny Boyle) and The Winter Guest (1997, actor Alan Rickman's directorial debut). In 2015, Sapochnik directed two episodes of Game of Thrones for the show's fifth season, "The Gift" and "Hardhome." He returned to direct the final two episodes of Game of Thrones' sixth season, "Battle of the Bastards" and "The Winds of Winter". All of these episodes received acclaim from both critics and viewers. Sapochnik won an Emmy Award for Outstanding Directing for a Drama Series at the 68th Primetime Emmy Awards, for directing "Battle of the Bastards". In 2016, it was announced that Sapochnik would direct the series premiere of the show Altered Carbon for Netflix. He will also direct an episode of Iron Fist. In September 2017, it was announced that Sapochnik would return to direct at least two episodes, or possibly three, of the eighth season of Game of Thrones, alongside David Nutter, David Benioff and D. B. Weiss for the remainder of the episodes. It was later confirmed that Sapochnik would direct the third and fifth episodes. Sapochnik has been married to actress Alexis Raben since 2006. ^ a b "Snowflake in Hell Films Limited". CompaniesLondon.com. Retrieved 2 July 2016. ^ a b Rich, Katey (19 March 2010). "Exclusive Interview: Repo Men Director Miguel Sapochnik". Cinema Blend. Retrieved 13 April 2012. ^ "Miguel Sapochnik Credits". TV Guide. Retrieved 23 August 2012. ^ Dawtrey, Adam (15 January 2006). "Sapochnik finally in view". Variety. Retrieved 23 August 2012. ^ "Miguel Sapochnik Filmography". The New York Times. Retrieved 23 August 2012. ^ "Exclusive: Repo Men director Miguel Sapochnik". Shock Till You Drop. 11 March 2010. Retrieved 23 August 2012. ^ Watchers on the Wall [@LovinGoT99] (1 August 2014). "Game of Thrones Season 5: What We Know So Far" (Tweet). Retrieved 6 February 2015 – via Twitter. ^ Wagmeister, Elizabeth (12 May 2016). "Joel Kinnaman to Star in Netflix Sci-Fi Series 'Altered Carbon'". Variety. Retrieved 20 September 2016. ^ Robinson, Joanna (29 June 2016). "The Best Director on Game of Thrones Won't Be Coming Back Next Year". Vanity Fair. Retrieved 20 September 2016. ^ Hibberd, James (26 September 2017). "Game of Thrones season 8 directors revealed: Fan favorites return". Entertainment Weekly. Retrieved 26 September 2017. ^ Chitwood, Adam (15 December 2017). "'Justice League' DP Fabian Wagner on Zack Snyder's Cut, Superman's Black Suit & 'Game of Thrones'". Collider. Archived from the original on 16 December 2017. Retrieved 18 December 2017. ^ "Miguel Sapochnik". IMDb. Retrieved 19 November 2018. ^ Brent Lang; Justin Kroll (26 October 2017). "Tom Hanks to Star in Sci-Fi Film 'Bios' From 'Game of Thrones' Director (EXCLUSIVE)". Variety. Retrieved 23 November 2017. Wikimedia Commons has media related to Miguel Sapochnik.